We believe in complete fair and transparent business dealings. This is the reason we have been able to survive in this competitive market. Bio-Gene Ditital Oil Bath Capacities comes in 5Ltr.-50Ltr. Thick Stainless Steel Bath (SS-304) with Fiber Insulation. Incubators. 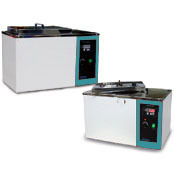 Digital Oil Bath provides ± 1.5°C accuracy and ± 3.0°C uniformity, temperature range from ambient +5°C to 300°C. Touch-sensitive membrane type front mount controller with timer, alarm and auto-tunning function. Stainless Steel & Ceramic Fiber 1.2 mm thickness corrosion resistant (SS-304) bath and ceramic fiber stands high temperature Over Temperature Protection and over current breaker ensure user safety.